ну, а пока первая ласточка. стоит ли доверять этому сайту? нет, не стоит. например, на концерт U2 есть билеты за 250 фунтов. на концерты, на которые билеты еще не начали продаваться. Я тут подумал, что мечтаю услышать в Туре песню I Will Talk And Hollywood Will Listen. Он вряд ли к ней вернется, но теоретически ее можно уместить в рамках концерта, например, заменяя с Advertising Space, которая, думаю, будет точно. Для этого надо хотя бы бросить курить. Да и в альберт холле все же исполнена живьем только частично,как мне кажется. я даже не знаю, почему ты так решил и даже, если так, то, что мешает также "частично" исполнить на другом концерте? Своего рода сообщение, чтобы были готовы к появлению билетов в ближайшем будущем. Кто не в курсе, это один из самых авторитетных билетных ресурсов. На U2 alarm более, чем сработал. Честно говоря, я больше за то, чтобы билеты в продажу поступили не раньше будущего года. Но, если учесть, что в октябре намечается отдельный концерт а-ля Берлин 2005 и тоже в Германии, то можно предположить, что пока alarm будет связан с этим отдельным концертом в этом году. еще один надежный билетный ресурс анонсирует. Через 3-5 недель появятся подробности Тура. Вопрос кто поедит в другие страны на концерт, планирует это? про Россию - без комментариев. Денег отвалят - приедет как миленький. "It might be 2010, I doubt it. But there will be a tour and I'm gonna be a busy boy for the next couple of years. I've got a few plans, but I don't think I'm gonna be touring next year." Чем же он занят так будет? 2009 has been a great year for music fans! There have been some great tours this year; who could ask for more? Don't look now, but 2010 may have even more in store for music enthusiasts. Whether you want to see bands reunite, or see a band that you never thought you would ever see, 2010 may hold something for you! Here are my picks for the top 10 "must-see" concerts of the coming year. 10. Depeche Mode—Tour of the Universe—For electronica music fans, Depeche Mode will continue their tour supporting their twelfth studio album Sounds of the Universe, which was released in April 2009. The tour will end in Germany on February 27, 2010. 9. The Who—For the fans that feared that Roger Daltrey's solo shows could end the band, it has been released that The Who will be going on tour in 2010. 8. Robbie Williams—Robbie Williams has not been on tour since 2006. Tickets for this tour will be hard to get, so order early. 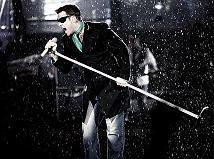 Robbie Williams sold 1.6 million tickets in one day when tickets went on sale for his tour in 2006. 7. AC/DC—Black Ice World Tour---AC/DC has been on tour supporting the band's 2008 release Black Ice. The tour will continue through 2010. The Australian band will return to Australia in February. The Australian dates were the fastest selling concert dates in the history of the country. The tour will then visit Japan and Europe later in the year. 6. Sir Paul McCartney—There are speculations that Paul McCartney will go on one LAST big tour. Rumors have it that 2010 will be the year that McCartney will go on his final tour. Be sure to get tickets for this! 5. Metallica—According to Spin Magazine, despite an already hectic touring schedule, Metallica will be continuing their tour throughout 2010, in support of their latest album Death Magnetic. 4. Creed—Creed has been on tour this year. Creed split up in 2004 and reunited for a tour this year. With Creed's new album Full Circle being released on October 6, 2009, speculations are that Creed will start a new tour to support their new album. 3. The Warped Tour—The Vans Warped Tour is a highly anticipated tour each year. With a successful tour in 2009, plans are already in effect for next year. For 2010, Vans wants YOUR opinion on who to schedule for The Warped Tour 2010. So get online and vote! 2. Dave Matthews Band—The Dave Matthews Band has been busy touring in 2009. Dates have not been confirmed yet, but Dave Matthews, himself, has hinted at a 2010 tour. 1. U2—With U2's tremendous success of the U2 360 tour this year, it is with much excitement that I announce speculations of a 2010 tour. U2 is by far one of the best shows that you will ever see. These guys have been entertaining audiences for over 30 years, so I highly recommend buying tickets to see these guys. There are rumors that U2 will also be releasing a new album next year, with the title Songs of Ascent. Hopefully, a tour will follow shortly after. На мегапродажи надеется ему не стоит.Прошло время тотальной скупки дисков и виной всему сами знаете что) все без исключения музыканты рубят бабло на концертах!Так что турне быть) эт он понтуется. если еще осенью я, как и вы все, думаю, ждал объявления Тура, то со временем свыкся с тем, что концерты раньше следующего года ожидать не стоит, да и слова Робби о том, что "не готов" воспринимались всерьез. ну не готов, значит не готов. зачем ехать во вред себе? и вот выясняется, что при все том же его нежелании, EMI требует от него тур-программы, пытаясь нагрести на этом последние деньжища с контракта. Robbie Williams is the best loved singer in the UK and that is not just In2town Lifestyle Magazine who says that, just ask all the millions of Robbie Williams fans. But fans may be disappointed to learn that although his management company are planning for Robbie Williams to tour, the superstar singer does not want to go back out on the road. The ex Take That singer management company, IE have already started planning a tour, which is rumoured to be a huge tour to celebrate the return of Robbie Williams, but there could be one big problem with the tour, it may not include Robbie Williams. Robbie has made his feelings clear that he does not want to tour at the moment, but his management company have told him he needs to tour. At the moment there is a stalemate, Robbie says he does not want to tour while IE say he has to tour and neither side are backing down. The management company behind Robbie want to capitalise on the huge success of his return album and have told the star that his fans want to see him back out on the road. Although Robbie loves his fans, he is worried about going on tour and fears his dreaded stage fright, which in the past has made him ill. The tour in 2006 had a number of dates cancelled which was down to illness that included his stage fright fear and Robbie knows if he goes out on tour again, he has to be 100% fit as he does not want to let down his fans, but the memories of his last tour with the stage fright does scare him. Fans of Robbie Williams have been asking for months if he will tour again, fearing comments made by the star that he may never tour again, may be true. But if his management have anything to do with it, a tour will be announced very shortly and the tickets will be guaranteed to sell out within hours. Better Man я с тобой полностью согласна ! Что это будет за тур из под палки? Глядя на то, как все лето Coldplay будут колесить (около 15 наберется) по европейским (и не только) фестивалям я вот подумал тут. Непонятно в каком состоянии вернется из Прогресс тура, как он будет смотреть на турне вообще, но мне кажется, что было бы круто, если бы в будущем году он также проехался по фестивалям, ну, а осенью отыграл бы дополнительную часть в Британии из концертов 10. Это наименее затратный вариант Тура, как мне кажется. Karina89: please Robbie,come to Spain!! nieks: and try listerning to the tallest man earth! Новый Тур - в июне 2013. Подтверждено на BBC Radio 2.